Cyclesnack: Is this really a 29er? This is not really a 29er, rather a mountain styled frame touted as an an urban bike with 700c wheels, which is the metric equivalent of the 29 inch wheel. I doubt there there is enough clearance on the Fatty Fork to accomodate a real 29er tire. The ballon tires rise off the rim a good two inches compared to the cross tires that this bike has on it that probably are only an inch. While this is not a true 29er, it is a nice looking bike. 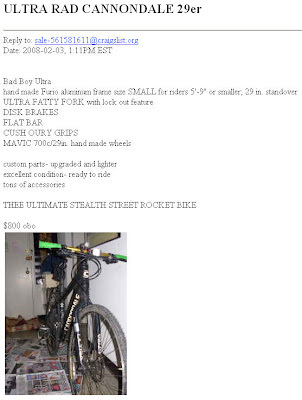 Somebody at work contacted me the other day about what kind of bike he should get for dual sport riding, riding Trails and Street. The only bike that I knew of that fits this category before today is the Gary Fisher Montare, but I would classify the BadBoy as definitely a Dual Sport bike as well. This would be a really cool bike if it were a singlespeed or even a fixie!